The gas water heater thermocouple is a safety device. It senses when the pilot light is on. When the pilot is not lit the gas valve will not turn the gas on. Make sure the problem is not your 'Water Heater Pilot LIght', before you attempt this repair. You could be looking at an hour to change it and ten or fifteen dollars for the part. The thermocouple is made of two different metals that are bonded together. There are (3) key things related to the thermocouple. 'Purchasing a Thermocouple', you can get generic ones that fit most water heaters at a hardware store. 'Removing the Burner Assembly', you will have to take the burner assembly out to change the thermocouple. 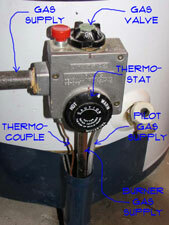 'Installing a Water Heater Thermocouple', With the burner assembly removed, installing the thermocouple is fairly easy. A thermocouple is basically a sensor that sends an electronic signal to the gas valve. The interesting thing is that this sensor does not use electricity to work. Instead it uses the heat from the pilot light to generate the electrical impulse that is sent to the gas valve. The end of the thermocouple is situated in the pilot light. As long as the pilot light is lit the gas valve senses it via the thermocouple. With the pilot light lit the gas valve will let gas go to the burner. When the thermocouple starts to fail it will send the wrong signals to the gas valve. The gas valve 'thinking' that the pilot light is out will shut off the gas. The burner won't light and the pilot light will go out. The translation of that is 'NO HOT WATER'. This is usually where the complaining starts. See what you need to do to correct this by reading on. The part is less than $20. It is a little bit of work to replace it. You will probably be looking at $100 to $125 in labor. This is assuming that you don't get talked into a new water heater. A new water heater can run $800 to $1,500 installed, depending on the type. Repairing a gas water heater thermocouple usually means that it needs to be replaced. You have to unhook the piping from the manifold and shut down the hot water tank. No draining for this repair. Try the pilot light first. If you have gotten to this article you have probably already tried. The hot water heater will not work with a bad gas water heater thermocouple. Not getting it back together or getting it installed incorrectly will leave you without hot water. You are also dealing with natural gas. Make sure the gas is turned off before you attempt any repairs. Gas can explode, make sure the valve is in the off position before you unhook anything. The thermoucouple is a simple replaceable part on your hot water heater. If it is not behaving as it should, replacing it is the only option. There are no adjustments or parts that can be repaired or replaced. If you have a pilot light that will not stay lit or a burner that will not ignite, the thermocouple is the likely culprit. There are universal thermocouples that will fit most water heaters, the length is the critical feature. You will need to measure the one that you have to determine what size you need. You can find a complete explanation in the topic, 'How To Purchase a Water Heater Thermocouple'. For an older water heater, it is likely that you will need to remove the burner assembly to free up the thermocouple before removing. For instructions see the article on 'How To Remove a Water Heater Burner Assembly'. Once the old thermocouple is removed and you have a new one in hand, all you have to do is install it. This is discussed in the article 'How To Install a Thermocouple'.